Figure 9.1. Elongation cycle of the translating ribosome. been bound) to the amino group of the aminoacyl-tRNA (Fig. 9.1 II). As a result, the formation of a new peptidyl-tRNA with the peptide elongated by one amino acid residue at the C-end takes place; the other product of the transpeptidation reaction is the deacylated tRNA. In order to make the ribosome competent to bind the next aminoacyl-tRNA, the intraribosomal ligands (tRNAs and mRNA) must be displaced, resulting in the vacation of a place for the aminoacyl-tRNA and in the positioning of the next mRNA codon (Fig. 9.1 III); this step is called translocation. 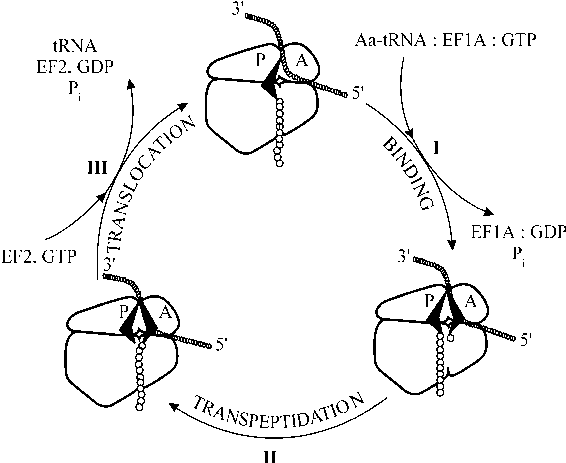 Thus, the working cycle of the ribosome in the course of elongation consists of three principal steps: codon-dependent binding of aminoacyl-tRNA (step I), transpeptidation (step II), and translocation (step III). The binding of aminoacyl-tRNA requires the presence of a special protein called elongation factor 1 (EF1); it is also called EF-Tu in the case of Prokaryotes, and eEF1 in the case of Eukaryotes. The binding is accompanied by the hydrolysis of a GTP molecule. Transpeptidation is catalyzed by the ribosome itself. Translocation requires another protein, elongation factor 2 (EF2), or EF-G in Prokaryotes and eEF2 in Eukaryotes, and is also accompanied by GTP hydrolysis. Pept(n)-tRNA' + Aa-tRNA''-*- Pept(n+1)-tRNA'' + tRNA'. Correspondingly, the binding sites of these two substrates on the ribosome have been designated as A and P sites. Hence, the strict operational definition of A and P sites is that they are the sites occupied by the substrates reacting with each other in the ribosome-catalyzed transpeptidation reaction. According to the classical two-site model (Watson, 1964; Lipmann, 1969), at stage I the aminoacyl-tRNA in the complex with EF1 (EF-Tu or eEF1) and GTP enters the ribosome and binds to the vacant template codon located therein. At this time the peptidyl-tRNA is in the P site. The binding of the aminoacyl-tRNA ends in GTP hydrolysis on the ribosome and the release of the EF1:GDP complex and orthophosphate into solution. At stage II the newly entered aminoacyl-tRNA located in the A site reacts with the peptidyl-tRNA in the P site; this results in the peptide C-terminus being transferred to the aminoacyl-tRNA. Now, the elongated peptidyl-tRNA (its tRNA residue) is occupying the A site while the deacylated tRNA formed in the reaction is located in the P site. At stage III the ribosome interacts with EF2 (EF-G or eEF2) and GTP, and this catalyzes the displacement of the peptidyl-tRNA (its tRNA residue) along with the template codon from the A site to the P site, as well as the release of the deacylated tRNA from the P site. During these events GTP undergoes hydrolysis, and then EF2, GDP and orthophosphate are released from the ribosome. This again leads to the situation whereby the peptidyl-tRNA is located in the P site while the next template codon is located in the A site; thus the A site is ready to accept the next aminoacyl-tRNA molecule. Translation of the whole coding sequence of the template polynucleotide and corresponding polypeptide elongation on the ribosome are achieved by the repetition of the cycles. It should be pointed out that both the initiation and termination of translation are simply modifications of the ribosomal working elongation cycle outlined above (see Chapters 14 and 15). The scheme sketched above describes only the most principal stages of the elongation cycle and omits many intermediate states. In particular, the problem of the "entry site" where aminoacyl-tRNA may be transiently present prior to the ultimate settling in the A site, and that of the "exit site" which may temporarily accomodate deacylated tRNA after its translocation from the P site, as well as intermediate states of translocation, are not outlined here and will be considered below (Section 9.5.3. and 9.5.4, respectively) and in Chapters 10 and 12. In any case, an analysis of the ribosomal working cycle demonstrates that the ribosome performs a number of functions in the course of translation, such as: (1) binding and retention of mRNA, (2) retention of peptidyl-tRNA, (3) binding of aminoacyl-tRNA, (4) binding of translation protein factors, (5) participation in the catalytic hydrolysis of GTP, (6) catalysis of transpeptidation, (7) the complex of intraribosomal displacements referred to as translocation. Different parts of the ribosome are responsible for performing these various functions. On the whole, the ribosome embodies the dualistic nature of translation: it is a decoding machine operating with a genetic message, and at the same time it is an enzyme synthesising a polypeptide chain. It is remarkable that the dualistic principle is reflected in the two-subunit construction of the ribosome and the partial functions of the subunits: whereas just the small subunit is involved in the genetic message binding and decoding, the large subunit is entirely responsible for the peptide-synthesising activity. Numerous approaches have been applied to ascertain ribosomal proteins and rRNA regions that take part in the formation of ribosome functional centers. Among them, site-specific chemical modifications and site-directed mutagenesis were thoroughly explored to selectively inactivate a function under investigation. Also localization of natural mutations leading to resistance against specific inhibitors of ribosomal functions was successfully used. A powerful approach to identifying proteins and rRNA regions forming ribosomal functional sites makes use of affinity labelling. With this technique a chemically active or photoactivable group is introduced into a corresponding ligand (e.g., mRNA, tRNA, translation factor, guanylic nucleotide, antibiotic) that specifically binds with the ribosome. This group attacks the ribosomal components located nearby and becomes crosslinked with them. Proteins and rRNA regions crosslinked with the ligand may then be identified. Furthermore, in some cases it has become possible to achieve hotoactivation of nonmodified synthetic and natural ligands (e.g., oligo- and polynucleotides) in order to produce their crosslinking with the nearest neighbors in the ribosome. It is clear, however, that this approach does not allow the components directly forming the mRNA-binding site and the components located nearby to be distinguished. Further development of this approach, specifically for identification components of RNA-binding centers of the ribosome, is the "site-directed cross-linking" technique. It is based on incorporation into mRNA or tRNA molecules of photoreactive nucleoside derivatives that can form the so-called "zero-length" cross-links. 4-Thiouridine (4-thioU) and 6-thioguanosine (6-thioG) derivatives are the most broadly used in these studies. They are very close analogues of "normal" nucleosides, and the occurrence of single 4-thioU or 6-thioG residues in an RNA molecule does not change its spatial structure. To form the RNA-RNA cross-link a photoreactive base has to be partially stacked with another RNA base. Thus, this approach allows to identify direct contacts between nucleotides of rRNA and RNA ligands (mRNA or tRNA). Another powerful methodological approach to localization of ligand binding sites on the ribosomal particles, and specifically on ribosomal RNA, is the "foot-printing" technique. It is based on the fact that a ligand may protect the nucleotide residues with which it interacts from chemical modifications. Noller et al. (1990) used a set of chemical probes, such as kethoxal, dimethyl sulfate, carbidiimide, for modification of accessible bases in ribosomal RNA or ribosomal particles. After the treatment with the probes, the RNA was used as a template for the extension of synthetic primer deoxyoligonucleotides by reverse transcriptase. The enzyme stops at the sites of modification causing the premature termination. The products of the reverse transcriptase reaction are analysed by electrophoresis on DNA sequencing gels. Hence, the protection of a base from chemical modification due to interaction with a ligand is visualized as the absence of a corresponding band on the gels. The ribosome has an intrinsic affinity to template polynucleotides. 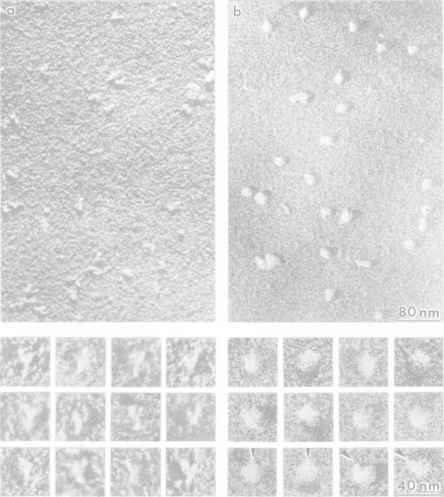 It has long been known that vacant ribosomes effectively bind polyuridylic acid. It is likely that the absence of a stable secondary and tertiary structure in poly(U) is an important factor contributing to its effective binding with the ribosomes. In the case of mRNA from natural sources, there are definite preferential sites on the polynucleotide for binding vacant ribosomes. In any case, stable double helices of RNA seem to be unable to serve as binding sites for vacant ribosomes. At the same time, in the course of translation (elongation) the ribosome passes along the entire coding sequence of mRNA and thus can transiently hold the template at any region of the sequence. The ribosome unfolds the translated template polynucleotide in such a way that the template section hold on the ribosome is devoid of its original secondary and tertiary structure. Codon-anticodon interactions with tRNA undoubtedly contribute to a retention of mRNA on the translating ribosome.